Plantronics has been producing headsets covering various wearing styles and price points. The BackBeat Pro 2 is Plantronics’ top tier wireless listening product, an over-ear headset coming in at $200. The BackBeat GO 3 is Plantronics’ latest wireless ear bud model going for a modest $99. As far on-ear headsets go, the BackBeat Sense is Plantronics’ wireless option coming in at $179. However, now the BackBeat Sense is not Plantronics’ only on-ear option, nor is the BackBeat GO 3 the most affordable. Enter the BackBeat 500 Series, an on-ear wireless headset coming in at $79.99. 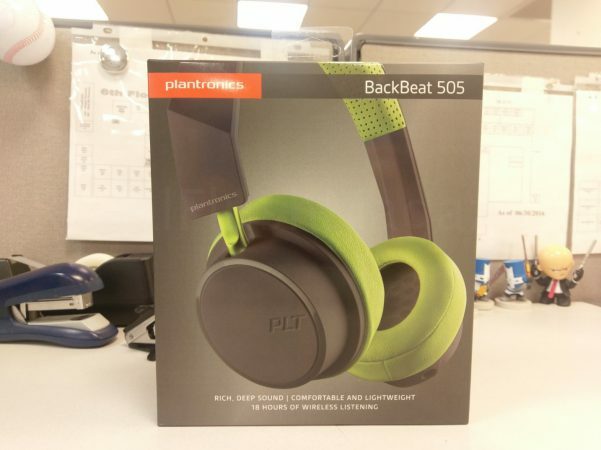 The BackBeat 500 Series is Plantronics’ latest entry into the wireless on-ear headset market, with the goal of continuing to give you Plantronics quality sound at a very approachable price point. The BackBeat 500 Series headset houses on-ear controls for full media control and phone call handling. 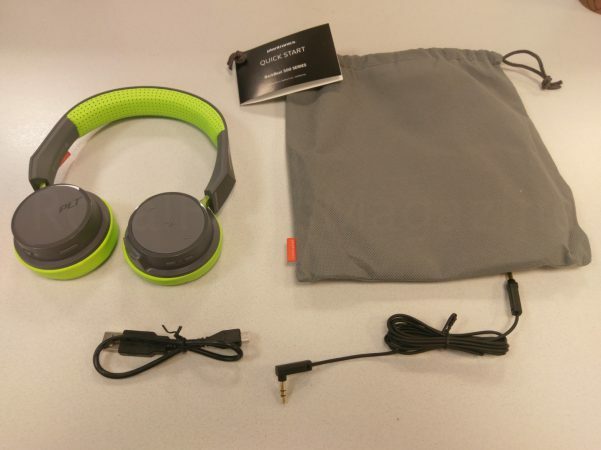 It comes with the full assortment of items one would ever need for an on-ear wireless headset: A micro-USB charging cable, a carrying sack, and a removable 3.5mm for when you wish to use the headset passively, while it’s powered off. The BackBeat 500 Series headset has a very light frame, with memory foam behind leatherette skin for the headband and ear cups. The ear cups house 40mm drivers designed to deliver Plantronics signature audio. On the right ear cup, you have a button for call handling and a switch that acts as the power toggle for the headset as well as a wireless pairing control. The left ear cup houses a standard set of controls for media and separate set for volume. Ports for the 3.5mm cable and USB charging are also found on the left ear cup. The BackBeat 500 Series starts off as a pretty comfortable headset, with a tight grip. The cushions on the headband and ear cups feel nice, with the ear cups themselves doing a pretty good job at passively isolating sound. That tight grip, while appreciated in most outdoor settings, however did lead to some minor fatigue after about 2 hours of non-stop wearing. So whatever is your method of breaking-in or loosening headphones, you will most likely have to employ it here if you wish to engage the BackBeat 500 Series for extended periods of time. Luckily the headset is VERY light, so the only pressure you’ll feel is against your ears. The controls of the headset are a breeze to get accustomed to, with almost no learning curve at all. All of your media controls are on the left ear cup, with the volume controls placed in a very distinctive manner: press up to raise volume and down to lower it. For music track controlling, press towards the “front” of the left ear cup to move forward in tracks, and vice versa. Your seldom-accessed controls such as pairing, power and call handing are on the right. Since you’re more than likely to use the BackBeat 500 Series headset for listening rather than call handling, you won’t find yourself mixing up the two. Overall, the BackBeat 500 Series headset has a nice build despite its fatigue over time due to its grip. At the very least, you can rest assured that the headset is acceptably secured on your head. Perhaps stretching out the headset with even more wear and tear outside of my 3 weeks plus usage would alleviate some of that long term tension. Otherwise, the build is sturdy and flexible with controls being easily accessible. The headset can even connect to two devices simultaneously for faster hopping between your two favorite media sources. Last but not least, each of the various color options are pleasing to the eye, offering three style options.